This reflective style vest is similar to the type you'd see police or runners wearing. Place this green "bib" over your shirt or jacket. Solid neon with front pockets and large front and back reflector panels. 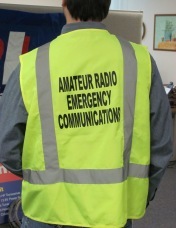 Imprinted with the words "AMATEUR RADIO EMERGENCY COMMUNICATIONS" on one side and the ARES logo on the other. Lightweight. Fold it up, and store this small handful in your immediate-response kit. Great for ARES volunteers, emergency and public service use.